This facility is split into two areas, one on each side of Tanyard Creek Road. 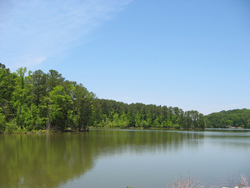 On one side is a swimming area. You will find a a large parking lot, bathrooms, a beach, a protected swimming area (no lifeguards), and a playground. The other side of the road has a boat launch. 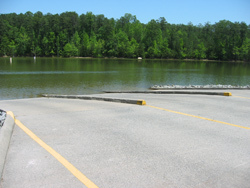 Over here you will find a 3 lane boat ramp, a large parking lot, and bathrooms. The boat dock adjacent to the boat ramp is only for loading and unloading of boats - 10 minute time limit, no sunbathing, no fishing, no swimming. You are required to pay a $4 per vehicle fee for using the beach, the boat launch, or for parking your rig in the parking lot. This fee can be paid at the park entry booth or, on days when it is not staffed, at the self serve collections boxes.